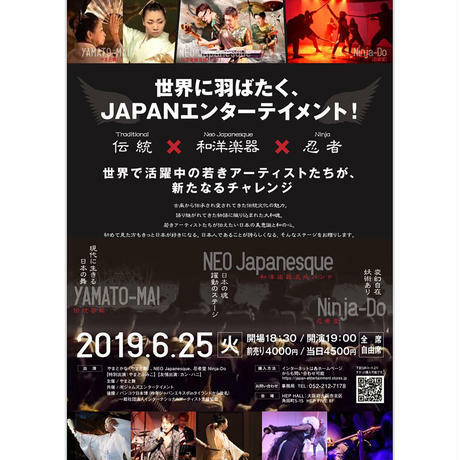 2019年6月25日（火） 会場：HEP HALL （HEP FIVE内8F) 時間：開場18：30 開演19：00 料金：前売り4,000円 / 当日4,500円 全席自由席 出演 ●やまとかな（やまと舞）https://www.yamatomai.com ●忍者堂Ninja-Do http://ninjado.jp ●NEO Japanesque https://www.jams-entertainment.com 【友情出演：カン・ハニ】http://hani-company.com 【特別出演：やまとふみこ】https://www.yamatomai.com o you REALLY know Japan? あなた、本当に日本のこと知ってる？ A rare opportunity to watch the latest style of Japanese Entertainment! 最新スタイルの日本エンタメを目にする、めったにないチャンス Young Japanese performers create an amazing fusion of traditional and future Japanese arts. 若い日本人パフォーマーたちが創り出す、ジャパンアートの伝統と未来の素晴らしい融合 《Performers》 Kana Yamato (Yamato Mai: Sacred Japanese dance), NEO Japanesque (Japanese and Western fusion band) and Ninja-Do (Ninja performance) 【 Special Guest：Hani ・Kang (Korean entertainer) 】 《Date & Time》 25th June 2019 (Tue) 19:00 (doors open 18:30) 《Duration》 Approximately 2 hours 《Place》 HEP Hall：HEP Five 8F 5-15 Kakuda-Cho, Kita-Ku, Osaka-shi, OSAKA (The building with a red Ferris wheel) 《Tickets》 Advance 4000 Yen, Door 4500 Yen 《Ticket purchase and queries》 Jams Entertainment https://www.jams-entertainment.com/ email:misaki@axel.ocn.ne.jp (Please use e-mail for non-Japanese enquiries) Phone：81-52-212-7178 FAX：81-52-212-7179 Traditional Japanese art is not only beautiful, but it also has special spirits called Yamato Damashii which contain harmony with nature and the world. 伝統的な日本文化は、その美しさだけではありません。そこには自然やその世界を含有する大和魂というものがあるのです。 Young artists are now trying to create new Japanese arts that integrate tradition and contemporary. This is a quite unique opportunity that you can watch as such passionate artists come together. 若いアーティストたちは、伝統と近代を統合させた新たな日本のアートを創り上げようとしています。これは、そのような情熱的なアーティストたちを見ることができる、珍しい機会です。 1. Kana Yamato (Yamato Mai - Yamato Dance) Yamato Mai is a sacred dance to dedicate to God and quite often performs at the Shrine. It also contains Kabuki Dance, Japanese Classic Dance, and Japanese traditional dance. Kana had been involved in children’s Kabuki since she was 6 years old, then learned different styles of Japanese dances. She now creates a new style of Japanese dance and carries Yamato Mai for the next generations. やまと舞は、しばしば神社で奉納される、神聖な踊りです。やまと舞には、歌舞伎舞踊、古典舞踊、日本舞踊も含まれます。かなは6歳の時から子供歌舞伎にかかわり、その後いくつかの異なる型の日本の舞踊を学びました。現在は、新しいスタイルの日本の舞踊を作り出しており、またやまと舞を次世代に引き継いでいます。 2. NEO Japanesque（Japanese and Western fusion band） NEO Japanesque has a very unique concept of integrating the sound of traditional Japanese instruments and Western electrical instruments. Their variety of music covers from original composition, old folk music to children’s songs or gospels. Their performance attracts people of all ages because of their sounds, costumes, stage decoration and performance as a whole. ネオジャパネスクは日本の伝統楽器と、西洋の電子楽器の音色を統合するという独特のコンセプトを持っています。オリジナルや民謡から童謡やゴスペルまで、彼らは幅広い音楽をカバーしています。彼らのパフォーマンスは、そのサウンド、衣装、舞台セット、そしてトータルなパフォーマンスとして、全世代の聴衆を魅了します。 3. Ninja-Do Ninja, the Japanese spy from an older period of Japan. Now the word Ninja is recognized all over the world and there are still many people who like the concept of Ninja. Ninja-Do’s Ninja performance is true entertainment and everyone can have a uniquely Japanese experience. Even if you don’t know anything about Ninja, it doesn’t matter. It is certain that you can enjoy their performance. 昔の日本のスパイである忍者。今や忍者という言葉は世界中で認められ、忍者というコンセプトを好きな人も大勢います。忍者堂の忍者パフォーマンスは、真実のエンターテイメントであり、誰もが日本での珍しい体験をすることができます。忍者のことを知らない人も、大丈夫です。彼らのパフォーマンスをお楽しみいただけることは、間違いありません。 『Special Guest』 Hani・Kang（Korean entertainer） A Korean singer, actor and TV personality, Hani・Kang, will navigate the stage on the day. <One of You>, a theme song of Korean Drama, <Brilliant Legacy>, broadcast in 2009 is one of Hani’s best hits. He has been actively involved to promote Korean and Japanese friendship.